This entry was posted on Friday, September 21st, 2007 at 3:20 pm and is filed under artist, composer, life, Music, nightingale, rag, ragtime, sheet music and song. 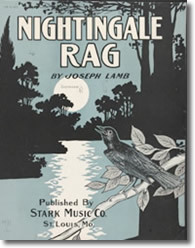 Tagged: john arpin, joseph lamb, Music, nightingale, rag, ragtime, sheet music. You can feed this entry. You can leave a response, or trackback from your own site. That is very interesting about the influences Lamb had on the writing of this piece…. I saw you perform in Ktown and your “Nightingale” is wonderful. When is your next event? Coming up to Ottawa soon? Thanks Alex. I’m playing every Sunday in Kingston at the Holiday Inn plus a number of private engagements in this area. No Ottawa gigs on the immediate horizon. I must say that I like your blog very much. I saw the ragtime covers here and in wikipedia, and I am very intrigued by them. I’ve been searching for a place that sells them as posters but couldn’t find any; even reproductions are a long-shot. Do you have any idea where can I find a place, maybe an online website, that sells reproductions of vintage ragtime advertisement posters? I own a book called “Memory Lane” ISBN 0 902063 13 8. It contains beautiful colour covers of Ragtime, Jazz, Foxtrot and other popular music from 1890-1925 selected by Max Wilk. If you can find this book, I’m sure you could scan the covers at high resolution and enlarge to poster size. If I find a store that sells posters , I’ll let you know. Thanks for the info Ross. Maybe I’ll order it sometime when I have the ‘push’. Enjoyed reading your blogs and viewing the beautiful sheet music covers. I’m curious if you know of any writings that examine the programmatic nature of ragtime pieces (without lyrics)? As you mention in your blog, the Nightingale Rag contains a good example of musical imagery. I’m wondering if most ragtime composers arbitrarily named their pieces or if they generally tried to draw a connection, however, subtle, between the music and their corresponding titles? Perhaps you may know of some books, articles or individuals that touch on this subject. Thanks for your time and your efforts to put this website up. I agree with you Paul that most titles seem arbitrary. There are certainly some exceptions that I can think of. Robert Hampton’s Cataract Rag evokes the vision of a waterfall for me. Similarly Joplin’s “The Cascades” has a waterfall strain as well. One of the best examples is William Bolcom’s “Graceful Ghost”. I can almost see the ghost floating through the room. There are other examples I’m sure. I know when I composed my own rags I chose the titles before I wrote the rags. “Happy Cat Rag” is my attempt at a Kitten on the Keys, ragtime format. There are notes clumped together and trills throughout ending with a final pounce. “Vitality Rag” is just that, a rag that is full of vitality to play and to listen to. “Ragtime Jalopy” begins with the Jalopy starting it’s engine, then putting down the road, complete with the Jalopy horn. There are some darker sections as the Jalopy makes it’s way through the sleazy parts of town. Those are my attempts at imagery. I’m not sure if there are books written on this. Maybe we should write one! « What is Classic Ragtime?